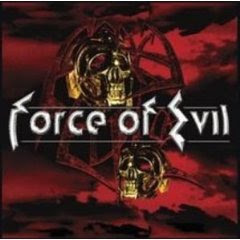 Hall of the Mountain King: Review: Force of Evil, "Force of Evil"
Review: Force of Evil, "Force of Evil"
If you miss the good old days of heavy metal, then this is the album for you. When I was growing up, there was no band darker or more evil than Mercyful Fate, with the power riffs of Hank Shermann and the ear-piercing wail of King Diamond. Now Shermann, tired of waiting on bandmate King Diamond to come back into the fold, strikes out on his own. He's recruited Mercyful Fate alums Michael Denner and Bjarne Holm, former King Diamond bassist Hal Patino and vocalist Martin Steene, for a debut album that, not surprisingly, sounds an awful lot like Mercyful Fate. In fact, listening to songs like "Eye of the Storm" and "Samhain," I could almost imagine myself back in those leather-and-spikes days. They're songs that can hang with the best of Mercyful Fate. Though he tries on songs like "Under the Blade," Steene doesn't quite have the vocal chops of King Diamond, but he's more than adequate to carry the songs, and those who don't like King's shrieks and growls might even prefer him. Musically, the album is solid. Guaranteed to get any old school metal fan banging his head. Review: Iced Earth, "The Glorious Burden"